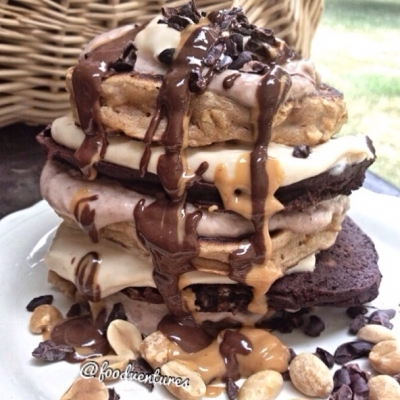 Enjoy dessert for breakfast with these reese's inspired pancakes - black and white pancakes layered with a peanut butter and chocolate cream. Breakfast never tasted so good! For pancakes: Combine ingredients, except baking cocoa. Add enough milk t form a batter. Evenly split the batter between 2 bowls. Set one aside. In the other bowl, add your baking cocoa. Cook up each batch of pancakes in your skillet, cooking a few minutes on each side then set aside to let cool. For filling: get out two bowls. Evenly split your yogurt between both bowls. To one bowl add your natural pb and to the other add your dark chocolate dreams. Mix well then layer between your pancakes. Top off with desired toppings. I topped mine off with a drizzle of natural pb, dark chocolate dreams, cacao nibs, and peanuts.